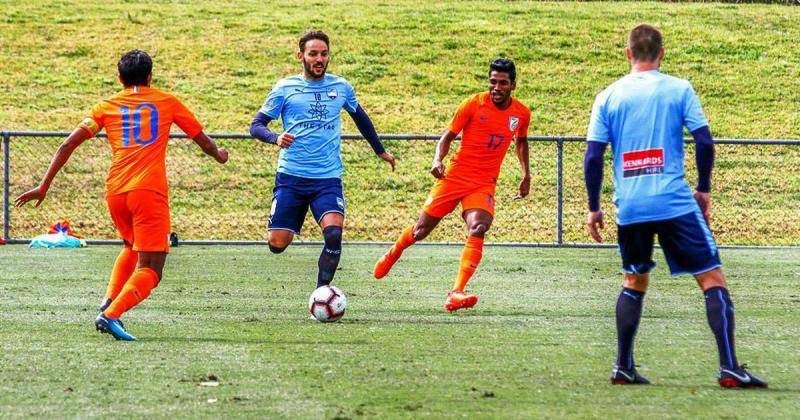 India’s U-23 football team went down 0-3 to three-time Australian A-League champions Sydney FC (www.mq.edu.au) in a friendly game at Macquarie University Sports Field in Sydney on Tuesday. The star-studded Sydney FC had to wait till the 37th minute to open the scoring through Brosquey before Adam Le Fondre doubled the gap within six minutes at the Macquarie University Sports Field. The Indians improved after the breather but a low strike from Trent Buhagiar in the 86th minute sealed the tie for the Sky Blues. Coach Stephen Constantine rang as many as five changes to the starting eleven from the last match against APIA Tigers FC as Davinder Singh, Jerry Lalrinzuala, Isaac Vanmalsawma, Hitesh Sharma and Vinit Rai made way for Subhasish Bose, Salam Ranjan Singh, Nandha Kumar, Germanpreet Singh and Anirudh Thapa respectively. As the coach predicted earlier, the hosts started dictating from the word go but their efforts were thwarted by a resilient Indian defence until Brosquey headed home a cross from Michael Zullo. Six minutes later, renowned English attacker, Le Fondre found the back of the net from a close range to double the lead before the teams headed to the dressing room. After the breather, Constantine tweaked in three changes in the form of Lallianzuala Chhangte, Vinit Rai and Manvir Singh withdrawing Nandha Kumar, Germanpreet Singh and Farukh Choudhary respectively. Ashique Kuruniyan came very close to break the deadlock but his firing shot went off the target. Constantine said they wanted a ‘tough game’ and this one was nothing less than a ‘very good lesson’ for the team. “We knew very well that it was going to be a tough test against a terrific team and certainly, it was. Our boys were a little surprised with their speed and constant movement but overall, it was a very good lesson for us”, Constantine said.